You’ve worked hard this tax season. So, to celebrate, we’ve rounded up a few places around the nation where you can find Tax Day freebies today. You’ve worked hard this tax season. Your employees, your CPA, and of course your payroll provider has been working hard as well to keep you and your business compliant. Not to mention, filing your own personal taxes is stressful in itself. So, to celebrate, we’ve rounded up a few places around the nation where you can find Tax Day freebies today. Thanks to Business Insider, USA Today and Living on the Cheap for the recommendations! Stop by participating locations to enjoy a free chocolate chip cookie. Kona Ice will have their trucks out, ready to serve you a free shave ice. 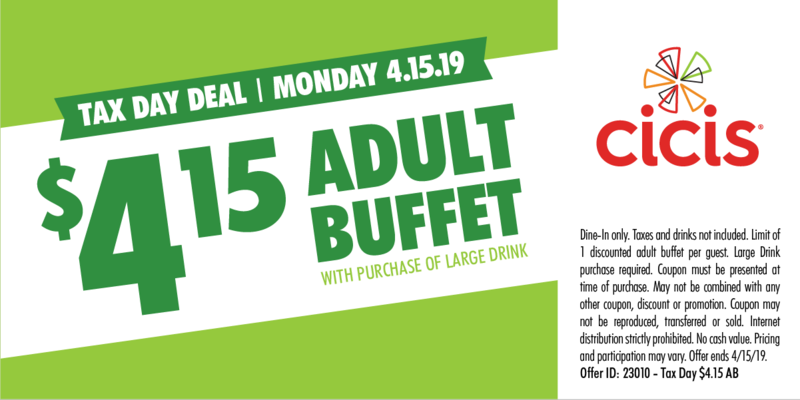 Enjoy an adult buffet for just $4.15 with the purchase of a large drink. 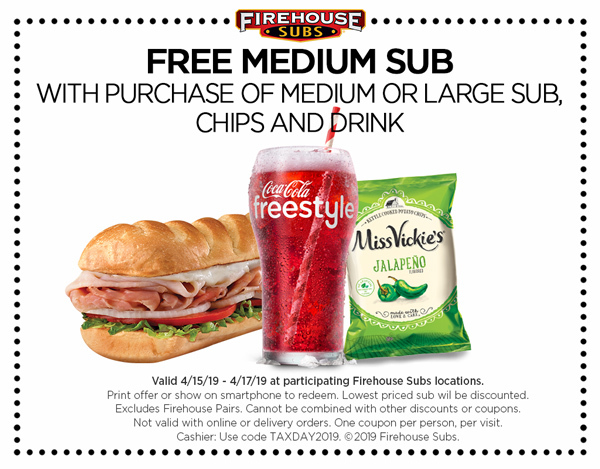 Get a free medium sub with the purchase of an additional medium or large sub, chips, and a medium drink. Use this coupon to claim. Say goodbye to any unused tax documents. Shred up to 5lbs for free using this coupon. All DD rewards members can get a medium hot or iced coffee for $1 all day on Tax Day at participating locations. This restaurant is really getting in on the Tax Day (fun?) and serving up free chips and queso whenever you say ‘1040’. Snag a cheeseburger for $4.15 from BurgerFi – but you must download the app first. Participating locations are offering a $10.40 half chicken individual meal with two sides, cornbread, and a drink. Details on their Facebook page. Enjoy a free sausage biscuit from 7 – 10 a.m. at participating locations. The catch is that you have to say “made from scratch” when ordering. This quick-service brand is giving away a free small frozen yogurt at participating locations. Purchase a Big Bagel Bundle for $10.40 from this bagel shop. Each bundle includes a chose of 13 bagels and two tubs of cream cheese. When using the Healthy Rewards app, you can get $2 off any 20-ounch smoothie at Smoothie King. All locations are offering a free HydroMassage until April 20. You just need this downloadable coupon. Oh, and membership is not required. OK we couldn’t make this list without putting ourselves on here too! We’re wrapping up an exciting giveaway that celebrates small businesses and the CPAs who have helped them survive tax season. To win a $50 Starbucks gift card, small business owners must ‘like’ a post on Facebook or LinkedIn, ‘like’ or ‘follow’ PrimePay, and shout out their CPA. Both the business owner and CPA win a gift card. The contest ends on April 23 – so nominate your CPA now. Subscribe for PrimePay blog updates.